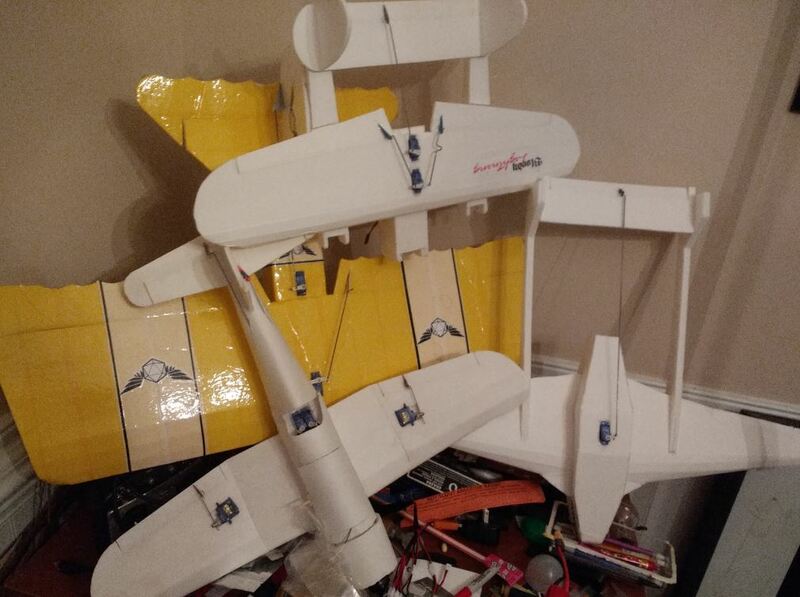 Hello all, I, probably like many, have limited space to store and work on building my planes. What are some space efficient ways to store them all? I have very little wall space and the little that I have is in front of my workbench so I would probably not store them there. I have room for some shelves I think although I thought I would check here for ideas first. Thanks! for my wings and planes i use these snap in shelf brackets with foam or pvc pipe wrapped around them to protect my planes. 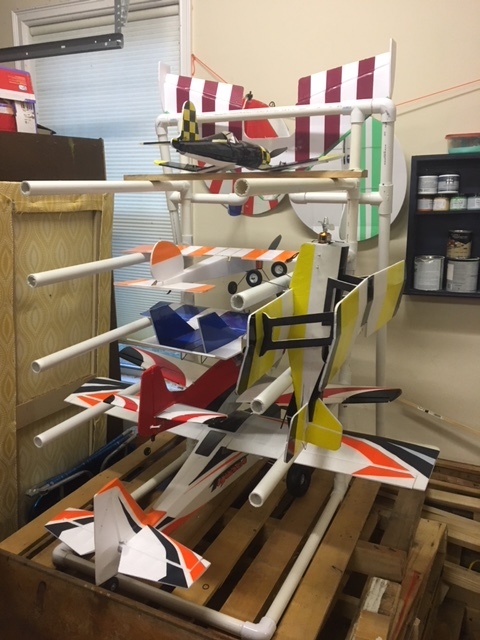 It works great as you can just adjust the height to fit any plane and they are so strong you can stack multiple planes on top of each other. 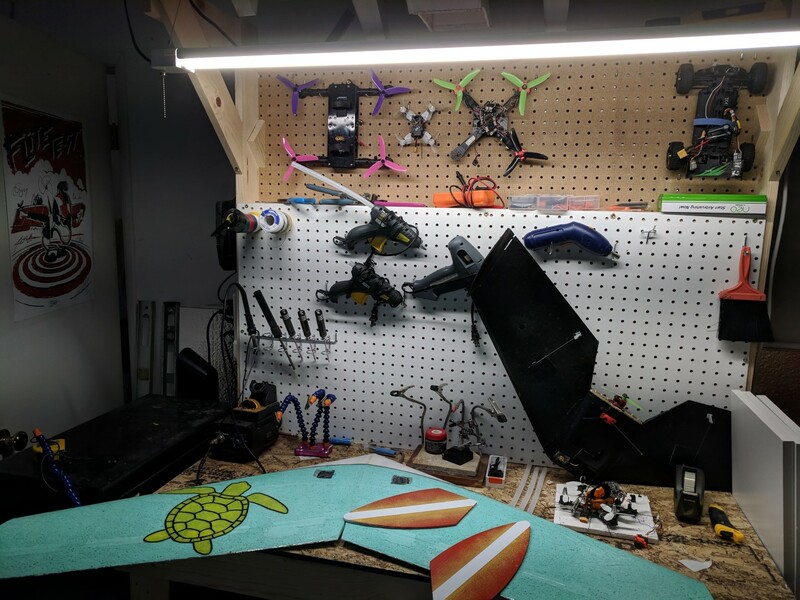 I dont have a picture right now of my workshop, but i cut the wall pieces down to about 3 or 4 feet and mounted them up to the ceiling so i can walk under the planes. 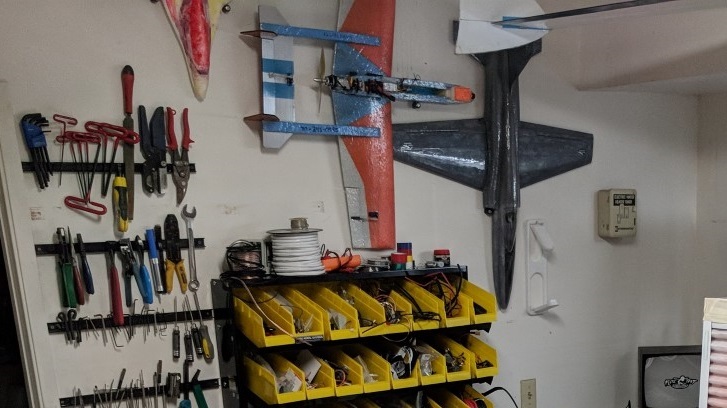 In our previous house i used command hooks to hang all my planes from the ceiling. Not one of them dropped over 3 years which is pretty amazing. The large hooks are rated for 5lbs, so with 2 of them, the way i did it, they could hold 10lbs. Hmm I have a bunch of those command clips at home, I might just have to put those to some good use. Another thing i have done is i always save these little plastic standoffs from wall mount tv adapter kits (we have a lot at work) but you could using anything really, even small pvc pip. 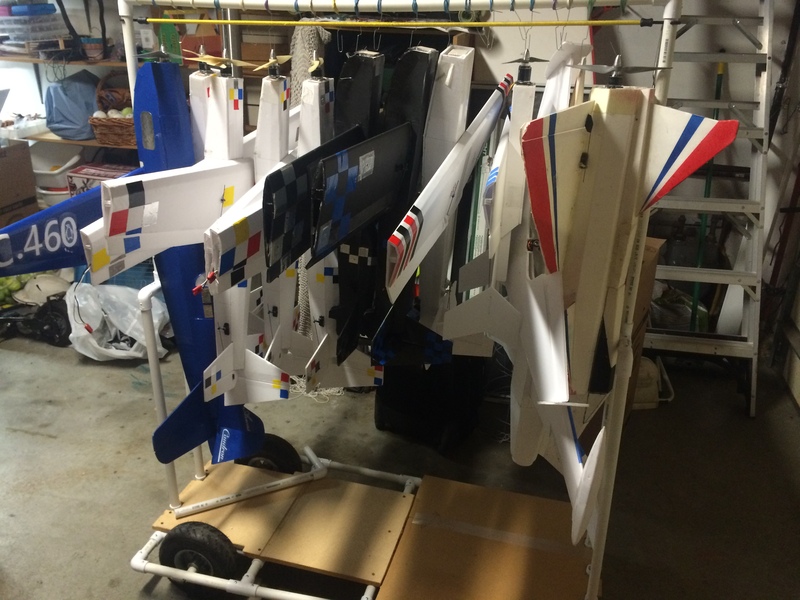 Just screw them into the wall and hang your airplanes on it as in this pic. Just be sure to follow the instructions. I think its something like clean the area with alcohol first, than you have to press them firmly for like 30 seconds? Thanks for the ideas guys. I might try what rockyboy suggested. Also, foamtest, are you the guy that runs the youtube channel by the same name? Built a rack out of PVC. Problem is it is already full! Landedit - Great Thread, I'm in need of one as well. That "hanger" is how we met if i remember. There was some guy out in the sun with this crazy rack of planes right behind my tent. Yep! And it was so nice to share that shade! Thanks. Ha! Nice, we camped beside you at Flite Fest. Nice, I think I remember you guys! Were you the guys who had the painted spits and left on Friday night? Nice, I remember you guys! Were you the guys who had the painted spits and left on Friday night? "How do you store your builds?" In the bag I put them in when I picked up the bits. 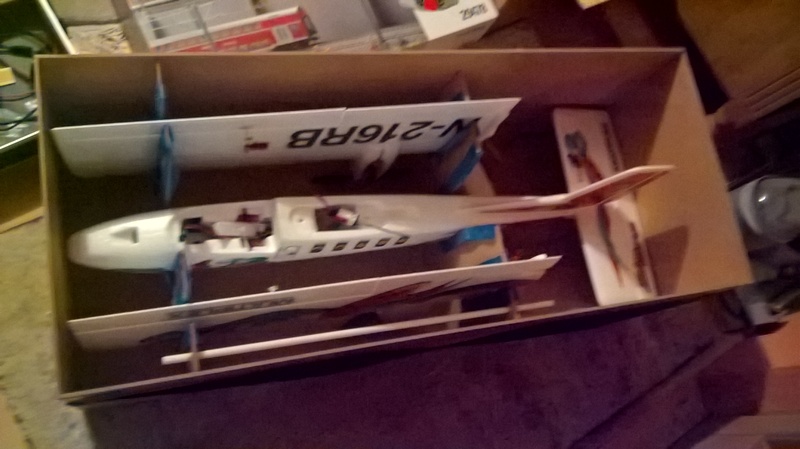 But that´s onely efficient with planes with removalbe wings. 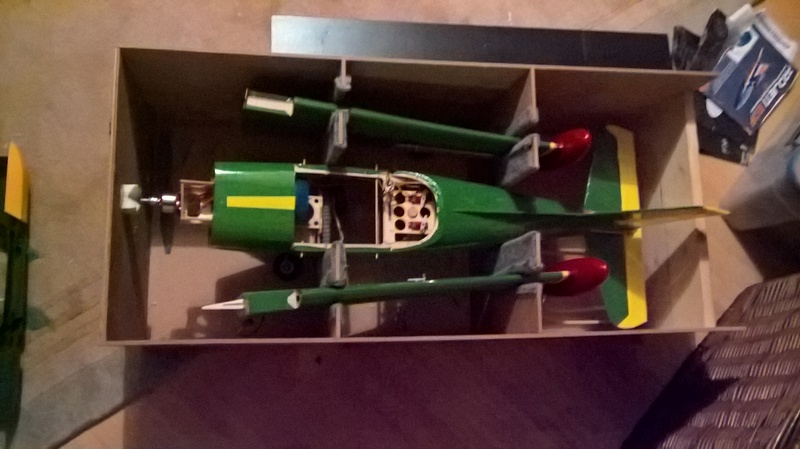 I´m planing to build a shelf for the boxes. I'm glad that you liked the FF video, and I hope to see you guys there again next year!